Doctors suggested that Hayley Lampshire may have to abort one of her unborn sons after they discovered the twins shared an amniotic sac and placenta. 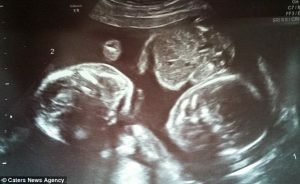 The Daily Mail reports the twins’ rare condition put their lives in jeopardy; the survival rate is only about 50 percent. But selectively aborting one of them would have 100-percent denied one child a chance at life. Lampshire and her husband said they were “heartbroken” when they heard the news, but their hopes were renewed when they saw an ultrasound image of their sons cuddling in the womb. The British family chose life for their twin boys. Rowan and Blake were born on Aug. 25; they now are home and doing well, according to the report. Lampshire said she learned about her Monoamniotic-Monochorionic twins when she was 12 weeks pregnant. The condition is rare, but it can be deadly for one or both of the twins. Doctors said the boys would have a better chance of survival if they stayed still, and they did, the family told the Mail. Ultrasounds of the twins gave the family hope. Lampshire said the images often looked like the boys were holding hands or cuddling inside her womb. She said they also stayed pretty still, another sign that gave her hope. At 34 weeks of pregnancy, Lampshire said her doctors told her she needed to give birth. If the boys grew any more, their lives could be in greater danger, she explained. The twins stayed in the hospital for three weeks before they were allowed to go home, the report states. She said her boys still like to cuddle, too. “So far they have been good at sharing, after all it saved their lives, but I’m sure it will be a different story when they get older,” she said. Lampshire urged other families to not give up hope if their baby or babies have been diagnosed with a risky condition. Doctors say the survival rate is increasing for Monoamniotic-Monochorionic twins, thanks to modern medical advancements. “Charlie and I were terrified at first, but we want to share our story to reassure others that there is hope, something that we struggled to find when doing our own research,” she said. This entry was posted on Wednesday, February 1st, 2017 at 7:20 pm	and is filed under News & Commentary. You can follow any responses to this entry through the RSS 2.0 feed. You can skip to the end and leave a response. Pinging is currently not allowed.